VideoStudio is a versatile, consumer-level video editing software designed by Corel. The application combines a professional-looking interface with a set of high-end specialty features to make a comprehensive and most satisfying video editor. It’s an ideal choice for the fledgling video editor looking to create stunning videos for family, friends, and online audience. The application comes with all the basic tools users look for in this category plus all the advanced features sported on high-end products. Its list of features include: Mask creator, multi-camera video editor, stop motion animation, motion tracking, Chromakey/green screen, enhance video color, numerous filters and effects, time remapping, track transparency, and an all-inclusive 360-degree editing suite. VideoStudio is a robust editing suite that features a straightforward, unintimidating, and user-friendly interface. The interface offers an easy gateway to all the basic features besides making all advanced features easy to work with. Better still, the interface is highly customizable, giving you the freedom to rearrange the key elements to create an appearance that fits your style. The platform nails the basics with its wide array of effects, superior multi-track editor, and a batch of video editing tools which are a click away from the main menu. Most the features come with a short video guiding you on their use. This enables all users; including the novices, to use the software with unprecedented ease. You will also be impressed by the live preview for all effects and titles. This enables you to see how the effects work before applying them. Additionally, VideoStudio features a fully-featured suite that provides adequate support for 360-degree video editing. The powerful tools enable you to convert 360 videos to the standard video which can be played on standard video players and TVs. The application also supports 4K Ultra High Definition as well as other high-end features. This means VideoStudio is a reliable program that can be used to edit any video, for just about every format. You will also marvel at the export options which include standard export-to-file and direct upload support for YouTube, Facebook, Vimeo, and Fivver. If you are considering VideoStudio it may also be beneficial to investigate other subcategories of Best Video Editing Software collected in our database of SaaS software reviews. Every company is different, and may need a special Video Editing Software solution that will be designed for their business size, type of clients and staff and even individual niche they support. We advise you don't count on finding an ideal solution that is going to work for each business no matter what their background is. It may be a good idea to read a few VideoStudio reviews first and even then you should remember what the software is intended to do for your company and your workers. Do you require a simple and straightforward service with just basic features? Will you actually make use of the advanced functionalities needed by pros and large enterprises? Are there any specific tools that are especially useful for the industry you work in? If you ask yourself these questions it will be much easier to find a solid solution that will fit your budget. How Much Does VideoStudio Cost? 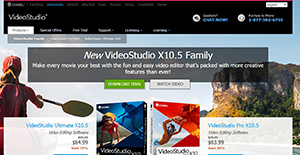 VideoStudio is offered at a one-off enterprise pricing fee of $64.99. For more details, please contact their support team. We realize that when you make a decision to buy Video Editing Software it’s important not only to see how experts evaluate it in their reviews, but also to find out if the real people and companies that buy it are actually satisfied with the product. That’s why we’ve created our behavior-based Customer Satisfaction Algorithm™ that gathers customer reviews, comments and VideoStudio reviews across a wide range of social media sites. The data is then presented in an easy to digest form showing how many people had positive and negative experience with VideoStudio. With that information at hand you should be equipped to make an informed buying decision that you won’t regret. What are VideoStudio pricing details? What integrations are available for VideoStudio? If you need more information about VideoStudio or you simply have a question let us know what you need and we’ll forward your request directly to the vendor.